Is Phillies-Mets a Rivalry Again? Aileen Gallagher knows more about horse racing than we do. She's previewing tomorrow's Kentucky Derby for us. We think she's already drank fifteen mint juleps today, to prepare. Twenty horses will race at the Kentucky Derby tomorrow, and such a big field guarantees a charged, chaotic start. (Horses are eligible for the Derby if they've won enough money in specific "graded," or significant, races. This many entrants means there's lots of quality 3-year-old horses this year.) The favorite is Lookin At Lucky (3–1), who drew the No. 1, or rail position. This is not lucky. When the race begins, look for all the jockeys to push the horses as close to the rail as possible. The rail position is the "shortest" version of the mile-and-a-quarter race, the spot every jockey wants. The horse that starts at the rail position is promptly cut off by nineteen other horses. Unless Lucky can immediately take first place, he will begin the race in the back. No horse has won from the rail since 1986. "Plan A is to break well," veteran trainer Bob Baffert told the Racing Form. "Plan B is we're screwed." 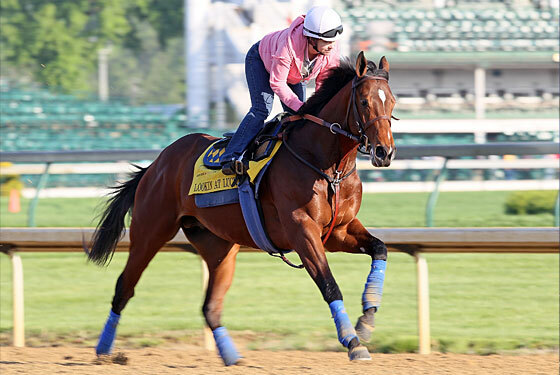 If you're looking for a Plan B and don't want to labor over the Form to see who's wearing blinkers and which horse is on Lasix (yes, performance-enhancing drugs are legal in the sport of kings), consult The Sports Section's Quick Guide to Long Shots. For our purposes, we are considering any horse with odds of 30–1 or higher to be a long shot. (Odds listed here were set on Thursday and will shift somewhat prior to post time at 6:24 p.m.) A $5 bet on a 50–1 horse pays out at about $255. Not bad for two minutes of shouting. He's won three of six career races, but they were pretty lame races. The competition here might be too tough. But if he starts slow and breaks out midway through the race, he could see money. His dad is Smarty Jones, who won the Derby and the Preakness in 2004 (and then lost the Belmont right in front of us). He's well rested, having run only two races this year. But he lost one of those by fourteen lengths to American Lion, so forget it. Who names a racehorse Kitten? All the other horses must laugh at him. Avoid Kitten: He's run only one race on dirt before (at Belmont) and lost by 33 lengths. Next! Yankee fans, do not put your money on Joe Torre's horse! Homeboy raced once this year and came in second. Back in February. He's starting from Position 19, which may as well be in the parking lot. And he has no balls. He's won his last three starts and is totally hot right now. He blew up in the Arkansas Derby last month, a race just one-eighth of a mile shorter than this one. We'll bet $10 to win. Or not. He's won one race in eight starts and is untested on dirt. Pass. One of many horses in the field who has performed well on synthetic tracks, but has little experience on actual dirt. He's on just three weeks' rest and apparently isn't too sharp at passing other horses in tight quarters. As we do, consult the Racing Form for more information. Happy Derby Day!